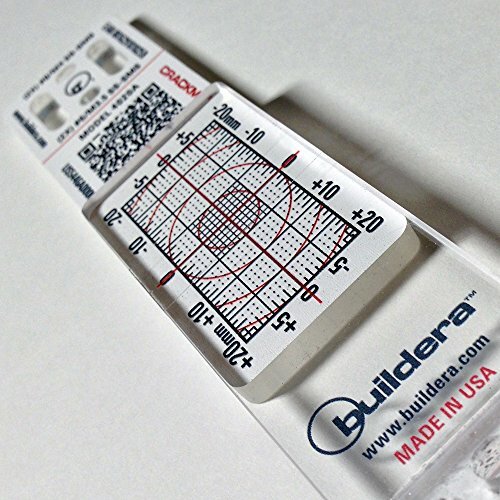 When Buildera designed the new CRACKMON® 4020A Building Foundation Crack Monitor, we sought a fresh approach that balanced the time-honored familiarity of classic crack monitors with modern digital manufacturing technology. The result: a vibrant new generation of flexible crack monitors for demanding commercial and industrial use. Just as important, we engineered and built the product from the ground up in the USA, underscoring our commitment to American ingenuity and jobs. The heavy-duty CRACKMON® 4020A offers several innovations so unique that we're patenting not only the novel new features, but also the manufacturing process, installation method, and data collection. In addition to familiar X-Y 2D Cartesian measurements, the redesigned measurement grid now includes a new polar-magnitude measurement function, effectively computing the angular hypotenuse (magnitude) of change from the zero-crossing. That's why we call it 2D+. What's more, to improve reading accuracy over the entire range, the measurement grid now sports variable-length tick marks, as well as patent-pending TickPoints™ at 1 mm x 1 mm intervals. TickPoints™ improve measurement accuracy as the measurement cross-hairs traverse the grid. This is particularly helpful when the two plates are no longer parallel. Unlike our prior generation of crack monitors that were pad or screen printed in one black color, we print the new CRACKMON® 4020A in five process colors, including a high-contrast rich-black text UV-cured over a thick double layer of brilliant opaque white ink. The result is a bright, bold measurement grid with a 2X contrast improvement that's much easier to read over a wide range of lighting conditions. To improve engineering traceability, each CRACKMON® 4020A crack monitor features a unique 15-character serial number that tracks the country of origin, design revision, and unique ID. This ensures engineering traceability in the field and offers a significant benefit and professionalism in forensic analysis. To put information at your fingertips, an imprinted QR code works with your mobile phone to access installation instructions and other helpful data, wherever you may be. Installers know that mounting a crack monitor using fasteners can be frustrating. Marking and aligning holes in one hand while holding the crack monitor in the other is a sure-fire way to lose your cool. And when it comes to hammer-drilling hard or rough surfaces like concrete or stucco, the percussive impact from a hammer-drill makes it tough to accurately drill holes in the right place. Buildera's new impact-absorbing drilling guide (patent pending) features an aggressive adhesive that sticks to concrete, masonry, stucco, steel, wood, and other rough surfaces. Simply peel it, stick it, and drill it. You'll get perfect holes every time—saving time and money on the job. Improved mounting options now include both horizontal and vertical slots, optimally sized to accept four different screw types including English (#8/#6) and Metric (M4/M3.5) fasteners, respectively. Optionally available is a stainless-steel Torx-Plus® tamper-resistant mounting kit and anchors. To avoid damaging the crack monitor, Buildera also supplies corrosion-resistant stainless-steel washers to help distribute the load for a secure installation. Not all cracks are coplanar. Buildera offers handy pre-cut Z-Shims to compensate for Z-axis shifts perpendicular to the crack at the time of installation. Using a binary range of thicknesses, virtually any Z-axis offset can be corrected in increments of 1mm or less. Consult Buildera for available shim options. Value equals benefits minus price. With all these improvements and benefits, the CRACKMON® 4020A offers more value than any crack monitor on the market today. When purchased In bulk, prices are competitive with economy crack monitors sold today, but with the benefits and premium features that only the CRACKMON™ 4020A offers. With so much more value from the CRACKMON® 4020A you'll never turn back. The CRACKMON® 4020A is available singly and in nominal quantities online and from our channel partners, or in bulk (starting at 50 qty/box) for distributors, resellers, and volume end-users. Order UPC 816291010198 | EAN 0816291010198 (box of 50). Buildera welcomes the opportunity to customize crack monitors with your logo and website. We can even customize the QR code to direct to your website for re-ordering. Minimum order commitment is 500 pieces. Setup charges apply. Consult Buildera for special requests and other options. Individual units sealed in a heavy-duty polybag. Includes installation instructions and crack progress chart. Mounting hardware or epoxy sold separately. Also available in bulk for resellers and volume end-users. Contact Buildera for volume pricing. Some products have volume discounts for Amazon Business customers. Log in using your business account. The 3-pack kit includes three (3) CRACKMON® 4020A Heavy-Duty Concrete Crack Monitors and (1) 5-minute structural thixotropic epoxy. Includes installation instructions and crack progress chart. Ideal for contractors, structural engineering firms and volume end-users, this 18-pack kit includes three (18) CRACKMON® 4020A Heavy-Duty Concrete Crack Monitors and three (3) dual syringes of 5-minute structural thixotropic epoxy. Includes installation instructions, crack progress chart, and one (1) bonus CRACKMON® 224R Crack-Width Comparator. This new bulk pack offers the best price-per-unit intended for high-volume end-users including contractors, engineers, surveyors, municipalities, and civil engineering companies. Includes fifty (50) CRACKMON® 4020A Heavy-Duty Concrete Crack Monitors per box with installation instructions, crack progress chart, and one (1) bonus CRACKMON® 224R Crack-Width Comparator. Enjoy substantial savings when buying in bulk. Premium structural mounting epoxy engineered for superior crack monitor installation to concrete, masonry, stucco, drywall, steel, wood, and other materials. Non-sagging, thixotropic adhesive won't run down walls or cause a runny mess typical of lower viscosity epoxies. Sets up and bonds in five minutes to clean substrates. Full cure in 24 hours. This packaging format is intended for bulk purchases for resellers. It includes a nested protective tube with options for a Eurohook or hang hole for retail point-of-sale displays. Each package includes (3) crack monitors, individually serialized for engineering traceability. Epoxy is not included allowing the customer to separately order or supply their own epoxy in any required ratio depending on the application. Includes engineered self-sticking hammer-drill template, tamper-resistant Torx-Plus® stainless-steel pentalobe fasteners, compression washers, and approved anchors. Requires Wiha or Wera Torx-Plus® IPR15 security driver bit (sold separately to qualified contractors and OEMs). Contact Buildera for pricing and fastener options. (Note the use of washers during mounting it essential to securing the crack monitor and to distribute load across the mounting surface area. Tighten by hand. Do not over-torque).